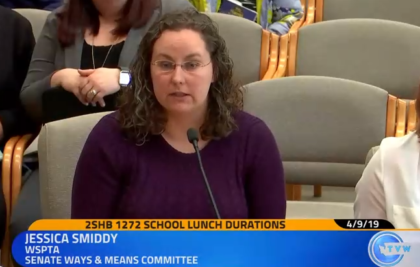 Bellevue PTSA Council parent Jessica Smiddy testified on behalf of Washington State PTA Monday, April 9, in favor of the school meals demonstration bill, HB 1272. Jessica was joined by Vancouver parent Caressa Milgrove, and several other speakers who all spoke in favor of the legislation. Despite the comments in favor and long list of supporters signed in Pro but not testifying, the bill did not secure enough signatures to move out of the Senate Ways & Means Committee. WSPTA is working with the bill sponsor Rep. My-Linh Thai, D-Bellevue, and other proponent organizations to find a solution that allows the pilot sites to go forward. Here’s the short testimony (starting in the 9th minute), plus interaction with members.